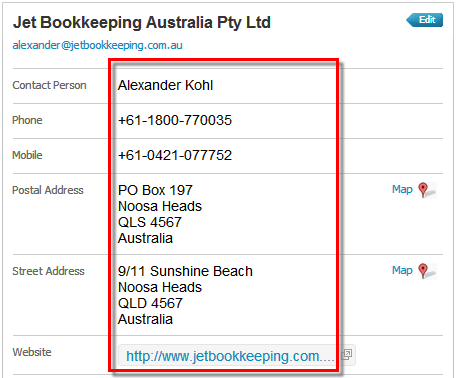 All contact and financial details, addresses sorted into Postal and Street in Xero. We check every phone number and make sure the mobile number ends up in the mobile field. We also check each address for variations of PO Box and automatically move it into the postal address fields. If you have duplicate contacts in MYOB or Reckon we will add an identifier to the name so that each contact will still appear in Xero. If you have contacts that are marked as inactive they will still be converted as they may have transactions associated with them. Simply archive these contacts in Xero following conversion. In regards to ‘Sales and purchase account codes for contacts’ – the default income and standard purchase account codes for contacts currently do not come across as part of the conversion. Bank details and all other financial details are converted as well as (excluding payment terms, bank account names and Statement Text). Contact Card ID is converted as Contact Account number in Xero. Contact custom fields such as Contact Logs are not available in Xero so do not come across in the conversion. You will need to update Bank details and other financial details in Xero following conversion. Emergency Contacts are not converted, only Primary contact information will convert. Customer credit card information cannot be exported out of QBO for security reasons.